Today Timothy is home from school for a Cold Day (not a lot of snow, just terribly cold out). Right now they are playing together nicely so I have to post now. Dissolve honey in warm water in a large bowl and stir in yeast. Proof until yeast is foamy. Mix salt and oil into yeast. Mix in flour one cup at a time. Turn dough onto a lightly floured surface and knead (just a little) Put dough into a well oiled bowl and turn to coat. Cover with a damp cloth. Let rise until doubled, approximately one hour. 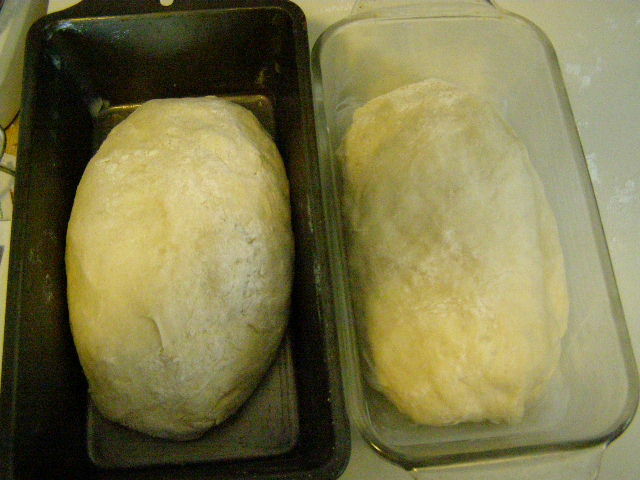 Turn dough onto a floured surface, punch down and either divide in half for two loaves or stretch it out for a BIG loaf. Place into well oiled loaf pans either way. Bake at 350 degrees for half an hour. So the secret ingredient is HONEY. You can try making this with sugar (i have) I tell you, the plain and simple truth is it just doesn’t taste the same. It has that homegrown taste when you add that honey! We also have granola in the oven from Regan Family Farm! I love this bread. I'm going to try it with Spelt flour and White Rice flour. Hi there! New follower here from Friday Blog Hop. So glad I found you! That granola sounds amazing!! Drop by and see me if you get the chance, thanks! I really need to try making bread. I've always thought about it, but have never jumped in. New follower from the Friday blog hop. I started baking bread from scratch about a year ago. I tried several recipes from a book, then decided the *best* bread was the one I made using a dinner roll recipe. LOL! Oh your house sounds delicious! I've never made bread without my bread maker, but I love love the bread maker. I'll have to give it a go some time.